&apos;Horn Peak&apos; (Jiaoshan) holds the first ridge-top watchtower eastwards on the Great Wall (not counting the easily-conquered northern Great Wall section to the North Korean border). 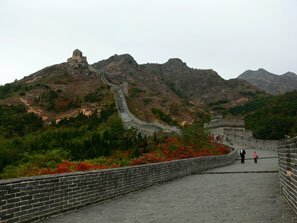 Horn Peak is "The First Mountain of the Great Wall", about 3 kilometers away from ancient city Shanhaiguan Pass. It is named after Jiaoshan (meaning "horn peak"), the highest peak of the north area of Shanhaiguan Pass, whose altitude reaches 519 meters. The Strategic Location of Jiaoshan and Its Great WallHorn Peak&apos;s Great Wall overlooked the most vulnerable part of the border between Manchuria and North China, and so was of the highest strategic significance in the Ming Dynasty. With the rest of the China-Manchuria border mountainous, the coastal plain offered by far the easiest way to march in an army. Shanhai Pass is where the coastal plain is at its narrowest, and so was the ideal place to mount a defence. 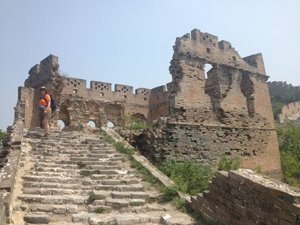 Horn Peak&apos;s Great Wall seals the 10-km (6-mi) -wide &apos;Mountain-Sea Pass&apos; (Shanhaiguan), and overlooks where Wall meets sea at &apos;Old Dragon Head&apos; (Laolongtou). 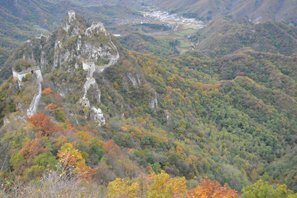 About 5 km (3 mi) north of highly-strategic Mountain-Sea Pass Fortress Town, Horn Peak is its closest mountain. Jiaoshan&apos;s Great Wall extends about 1,500 meters (1,600 yards) from Hanmen Pass at the foot of the mountain to Dapingding (&apos;Big Flat Summit&apos;), the highest point. Materials and dimensions: This section was built (and restored) with locally quarried rocks and bricks. 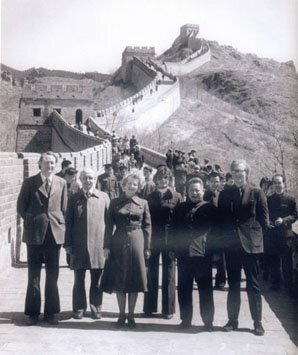 The height of the wall ranges from 7 to 10 meters (23–33&apos;), and the average width is 4 to 5 meters (13–16&apos;), although at one point it narrows to just 2.7 meters (9&apos;). There are beacon towers as well as flanking towers, and a fort included in Jiaoshan&apos;s Great Wall section. Jiaoshan&apos;s Great Wall used steep topography to make it hard to attack. The west side of the Wall has shallower slopes, which made it easy for soldiers to climb up to the wall to defend it. Some parts of the Great Wall on Horn peak have shallow slopes and are sinuous, but some are very steep. Jiaoshan&apos;s major tourist spots are Big Flat Summit, Hanmen Pass, and Qixian Temple. The Great Wall at Jiaoshan climaxes at &apos;Big Flat Summit&apos; (大平顶 Dàpíngdǐng /daa-ping-ding/). From there visitors have a spectacular view of the Yan Mountains, stretching to north of Beijing, and the nearby Bo Sea. The scenery of the Great Wall and its surroundings is magnificent. Big Flat Summit can hold hundreds of people. Rocky caps (and the watchtower) on Horn Peak look like a giant dragon&apos;s horns, hence its name. The summit of Horn Peak is an ideal place to watch a sunrise over the sea or the peak. A little way down from the summit, visitors can get a magnificent view of "sun resting on the auspicious lotus" — the rocky "horns" of Jiaoshan looking like lotus petals. Hanmen Pass (旱门关 /han-mnn gwan/ &apos;Drought Gate Pass&apos;) is the location of the first watchtower on the Jiaoshan section of the Great Wall. It stands 3 km (2 mi) north of Shanhai Pass Fort at a similar elevation. 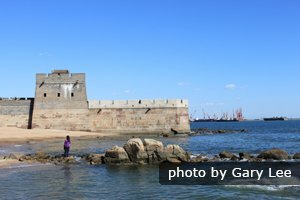 Hanmen Pass was once linked to the Mountain-Sea Pass Fortress Town by Great Wall, and is one of the ten biggest fortifications in Shanhai Pass. Qixian Temple (Qīxián Sì 栖贤寺/chee-sshyen srr/ &apos;House of the Virtuous Temple&apos;) is a wood and brick structure, 100 meters west of the Great Wall about half way up Horn Peak. In ancient times learned locals went there to find peace and quiet for reading. The temple has an extraordinary view in summer called &apos;Mountain Temple Rain Clear&apos; (山寺雨晴 Shānsì Yǔqíng /shan-srr yoo-ching/). When it rains on the peak, it is sometimes sunny at the temple with a red sun hanging in the sky, and vice versa. The two places are only 400 meters apart, but they can have different weather, which is an amazing scene. Hiking: Walking conditions on the Jiaoshan Great Wall section pose no significant risks, because the wall is well-restored and paved. However, at some points there are very steep steps, and the mountain paths are less easy going. Summer offers the best views. Winter may be very cold, snowy, and treacherous. How to Get to Jiaoshan&apos;s Great Wall? There are no public buses to Jiaoshan Scenic Area (角山风景区). It&apos;s a 5-km (3-mi) walk north from the railway station. A taxi should be about 20 yuan. Show the driver the Chinese above. Alternatively you can take a tour. China Highlights&apos; tours avoid the hassles of getting to and enjoying the Great Wall. See below. In Shanhaiguan Town there are hotels of various levels and restaurants to cater for tourists. Shanhai Pass — Learn more about the Great Wall fortress controlling this area. China Highlights has been specializing in tailor-making China tours for over sixteen years. 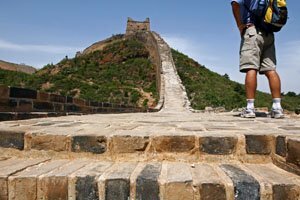 If you want to visit Horn Peak&apos;s Great Wall, contact us and we can help you design a tour according to your requirements. 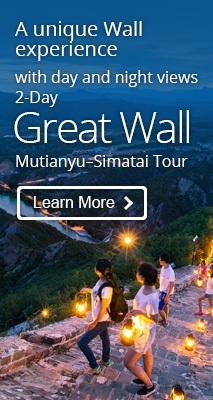 See our most popular Great Wall tours.